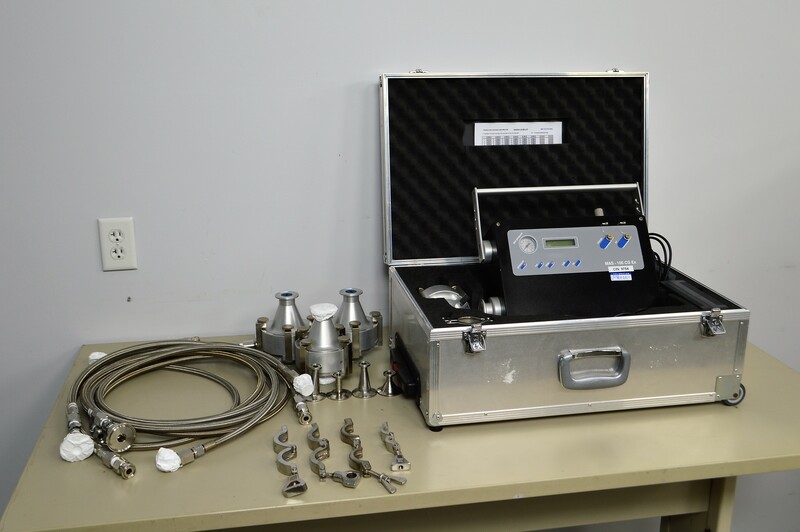 Millipore MVB MAS-100 CG Ex Microbial Air Monitoring Sampling Compressed Gas . New Life Scientific, Inc. This product ships in two boxes and thus must be quoted specifically for interested customers. Please send us a message and we'll be glad to give you a shipping quote. Available from New Life Scientific is a hard-to-find MAS-100 CG EX, part of the well-built line of MAS-100 microbial air samplers manufactured by Millipore. It comes outfitted with fittings of various sizes, braided hosing, several consumables, and snugly packed in a hard-walled case for safe transport. This instrument is over $20,000 new, so now is an opportunity to obtain one for less than a third of its new price and backed by our 90-day warranty. Please note, in order to record data, it may require a pc and software from Millipore. The technician performed a sample run and the detector recognized no / low pressure, good pressure, and releases it when the test is finished. The battery held charge well, but no further testing was performed. The ideal test involves passing compressed gas across the plate and consumable petri dish (not included) with controlled decompression, allowing any airborne micro-organisms to collect on dish's surface. The sampler did not produce numerical data and the technician perceived that as an indication the data is recorded and transmitted to the PC for documentation. NLS did not acquire a separate PC or software, and the technician was unable to retrieve his readings. The MAS-100 sampler is in good cosmetic condition and includes a number of accessories in a protective carrying case for safe transport. The included accessories and parts are in good condition and constructed of stainless steel or aluminum. The o-rings and / or septum are not labeled materials. While New Life Scientific takes many steps to ensure that the instruments are in perfect working order, we cannot ensure that all products are up to manufacturer specifications. We recommend every product undergo professional installation and calibration before use in research, production, and clinical applications. For this reason, we offer a 90-day warranty for all working products in the interest of maximum customer satisfaction.